These banana pancakes aren’t your average, run-of-the-mill, Bisquick pancakes, which is exactly why I love them. See, unlike many fellow humans, I’ve never really been a fan of pancakes. Unless they’re drenched in butter and syrup, I really don’t see the appeal. They’re just flattened pillows of blandness that get stuck to the roof of your mouth. I’ve only come across two kinds of pancakes I’ve liked in my life besides these ones. 1. My dad’s French pancakes, a.k.a. crepes. I’m a savory gal, so any pancake that allows me to stuff bacon and avocado inside, I’m on board with. 2. The pancakes at OP Cafe in Santa Monica. My boyfriend’s sister introduced them to me, describing them as crunchy. Although I wasn’t really sure what she meant by that, after one bite I totally understood. They’re flatter than most pancakes I’ve encountered and they have these crunchy edges that taste like heaven. I honestly can’t even describe them in a more technical way. Just go try them, you’ll know what I mean. Anyway, I found the basic recipe for these pancakes on Pinterest. They’re known as “two-ingredient pancakes” because, well, you only need two ingredients to make them (duh). The ingredients are eggs and bananas. I love this recipe because it’s a good way to use your overripe bananas without having to bake. My old roommate’s dog ate the only loaf of banana bread I’ver ever been proud of (hashtag horrible baker). These pancakes are super thin and their texture is a little more moist than traditional pancakes. One thing I will admit, is that they usually aren’t too pretty. They don’t have that handsome golden-brown color of regular pancakes, but what they lack in looks, they make up in flavor. And you can ditch the syrup (sorry, Aunt Jemima). I like to top mine with fresh fruit and peanut butter, but you could eat them solo and your taste buds would still be singing. 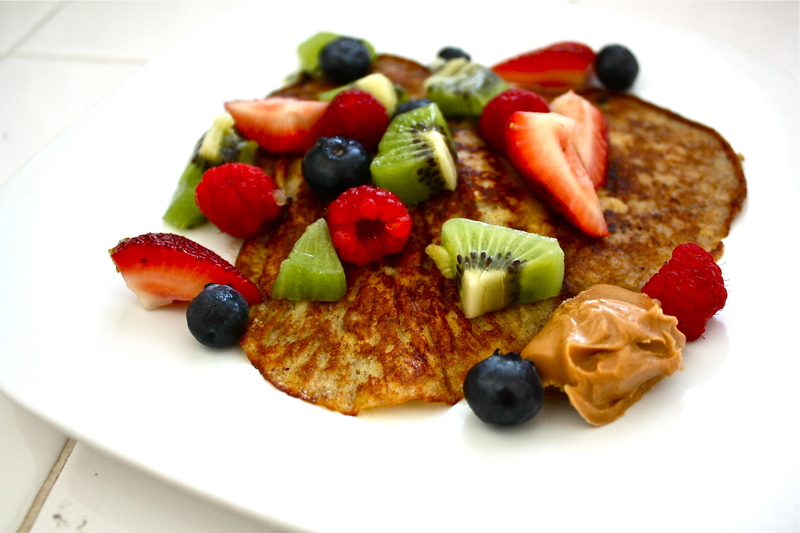 Pancake toppings: Berries, fruit, almond butter, peanut butter, whip cream, syrup (if you must), etc. Heat up a non-stick pan on medium heat and spray (or oil) the pan. Mash one ripe banana in a bowl and beat with an egg until well combined. The texture should be smooth, but slightly lumpy. Add the cinnamon and nutmeg to the mixture and stir. Ladle the mixture into the heated pan forming silver dollar-sized pancakes. I‘ve found that smaller pancakes are easier (and less messy) to flip. Once the pancakes are completely cooked on one side (about 3-4 mins), carefully flip over and finish cooking on the other side (an additional 2-4 mins). Once the pancakes are fully cooked, plate and top with your favorite toppings. Here I used fresh kiwi, strawberries, blueberries, and raspberries with a dollop of peanut butter. *These portions are for one person. The banana-egg ratio is 1/1 so if cooking for two people, I suggest using two eggs and two bananas.